I’d got to the stage in my life that I wanted to give something back and do something that made me feel good about myself. I have an interesting job but its very commercial. Maybe it was a bit of ‘mid-life crisis’ too combined with empty nest – my son hadn’t long left home. I’m not sure really but I was looking for something and I didn’t know what it was exactly. I looked up different volunteering opportunities and I saw Keynsham Mencap but I dismissed it initially as I thought it would be working one-to-one with people. 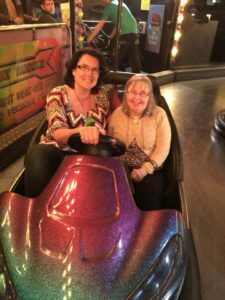 As I had no experience of learning disabilities and I was worried I might not like it and end up letting people down. 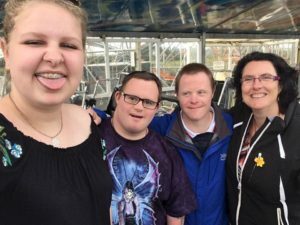 I saw a friend on Facebook posting photos of her volunteering with Mencap and it didn’t look like one-to-one so I asked her – she said it was the best thing she’d ever done so I got in touch. I started volunteering at the end of November 2014 at the 18+ club every Thursday evening. They sent me on the MIDAS mini bus course so I also drive a mini bus on some of the trips out on a Thursday evening. 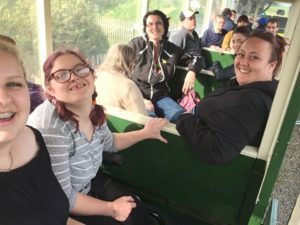 I also do day trips such as the Millfield School Day in June which is excellent, I help with fundraising events and attend the disco for learning disabilities in Bath. There is the Christmas dinner and other events for local groups with LD that can happen on weekday evenings or weekends. I also do all the holidays now as these are a real opportunity to get to know members. I won’t pretend that they are not hard work but the personal reward is phenomenal – like nothing else I have experienced. On a Thursday evening we use St Dunstan’s church hall and members come here for 7.30pm. 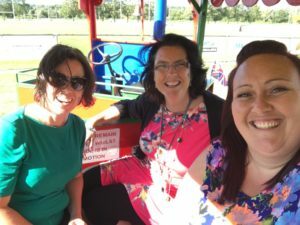 There is a programme of events that is always different and mixing things up such as BBQ, disco, smoothy making, crafts, drumming, yoga, dancing, crafts, games, dressing up, circus skills… the list goes on. When I’m in the hall I help to encourage members to take part, some just need a little encouragement to make the first move, or a bit of support to take part. Often they just need a smile and a bit of congratulations to help them know they are doing the right thing. You get to know members so you chat about their week, what they have done at work or where they have been that week. If there is music and dancing well I’m up there with them dancing like no one is watching – our guys LOVE dancing! 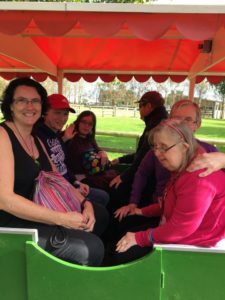 If I go out on the trip – there is a trip out most weeks – then I sometimes drive the bus and other times just form part of the volunteer support team. We help to make sure we take all the right people who have signed up and bring them all back! 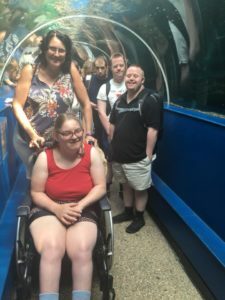 While we are on our trip we help members take part in the activities which might involve – crazy golf, a meal out, bowling, a boat trip, trip to the pub, picnic in the park, trampolining… all sorts of things! The best thing about volunteering is making people happy. By doing the simplest things I can have a positive impact on someone else. Each week I walk through the door and I’m greeted with smiles, handshakes, high fives, eagerness to tell me their news… its just the best feeling. The clubs can be the highlight of some of our members weeks so the ability to contribute and make their experience good is a real privilege. Holidays are something else entirely!  having an S Club 7 dance party at 1am in a toilet is a riot! If you are interested in making a difference then give this a try, see how it feels and if its for you. Its the best thing I have ever done and I can’t get enough of the opportunities and experiences it gives me.